The F-35 might be the Pentagon’s premiere cutting-edge fighter jet, but its engines are so unreliable the whole project may prove to be unaffordable unless performance improves, recent government audits have concluded. Pratt & Whitney, the engine manufacturer, “had an outdated software development plan, requirements traceability issues, and a software quality assurance organization that did not perform required functions,” the Inspector-General wrote. This comes following two reports by the Government Accountability Office (GAO), released this month, calling the F-35’s engine performance “very poor” and questioning the projected expenses of the current procurement program in light of more problems being expected to arise. 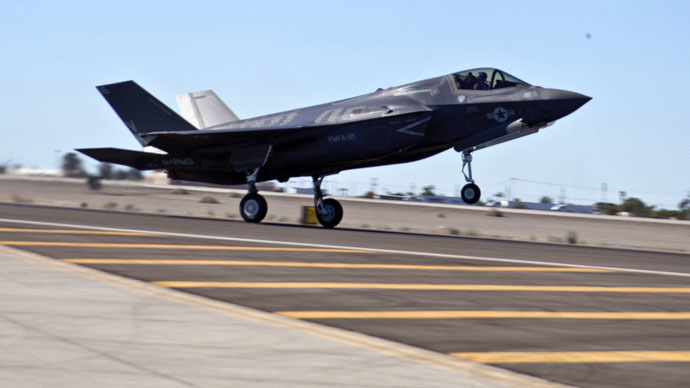 The “consistent changes” in procurement plans for the F-35 indicate that previous analyses by the Department of Defense’s “did not adequately account for future technical and funding uncertainty,” the GAO report states. According to the GAO and Pentagon auditors, engines on the Air Force and Navy models of the F-35 flew about 25 hours between failures, instead of the 120 hours planned. The Marine Corps’ model performed slightly better, flying about 47 hours between failures caused by engine design issues, instead of the projected 90 hours. “While the report lists some propulsion concerns,” the Pentagon has “validated our reliability performance,” Bates said.